Communication is one of the very important part of a human being’s evolution.Without having a proper communication among the human beings, we cannot imagine the evolution of the world to the bitter place like that is existing right now. That is why,from the beginning human beings has put is a sustained and serious effort in developing a communication system from one person to another person from one place to another place. Language is the first way of communication among the people. People tried very hard to make up a language which is understandable for everybody.Right from the human birth,we struggle a lot to learn a language so that we can communicate. There are broadly two types of communications like one-to-one communication and one to many communication.Telephonic conversation is a simple example of a one-to-one communication whereas a TV and the radio is a one to many communication systems. Communication simply is a act of transmission of information from one place to another place. If you want to communicate with a large gathering we can simply use a microphone which will make you are able better when compared with the solo voice. But anyway this way of communication is limited to a very small region and if you want to communicate to a very large area like a big city, any kind of big Microphone is not going to be sufficient. 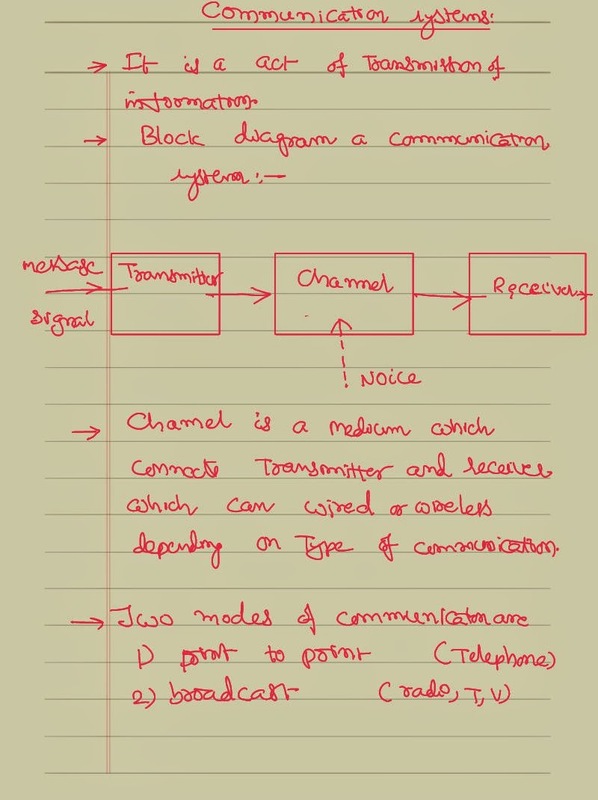 This kind of a communication system needs a particular process which requires a transmitter which emits the signal, a channel which acts like a media to communicate the signal from one place to another place and a receiver who can receive the information. At the level of the channel there is always a possibility of getting a noise added and this kind of the phenomena is called distortion. To eliminate this kind of the problems we will fine-tune the circuit. It is done with the filter circuits.The channel could be a wired one or a wireless one depending on the type of the communication. There are different ways of the messages that you can communicate from one place to another place like it could be a speech, music or a video. To communicate each of this kind of information a particular frequency will be more suitable.The table is being given below. There are broadly three ways of communication from one place to another place.The oldest type of the communication system is ground wave communication or ground wave propagation. This kind of a communication system will be having a particular antenna ,which will release the signal into the air and that signal is going to travel over the surface of the earth taking the earth as a reference. Ground wave communication has broadly two issues. The first one is the size of the antenna. As for the practical observations.the height of the antenna required shall be at least equal to 1 by fourth of the wavelength of the signal that we want to pass. In all practical ways, we can thus send only low wave length and hence this kind of propagation is not possible. The other serious issue that this ground wave communication has is having a clean surface. The signal that has to pass be passed on the surface of the ground can reach the destination only when the surface is in a comfortable mode such that there is no obstructions .But in a day-to-day life,all these surfaces are filled with buildings, trees, towers, minerals, hills and hence all these obstacles will absorb a portion of the signal.Hence it will be never able to reach the destination successfully without any serious loss. 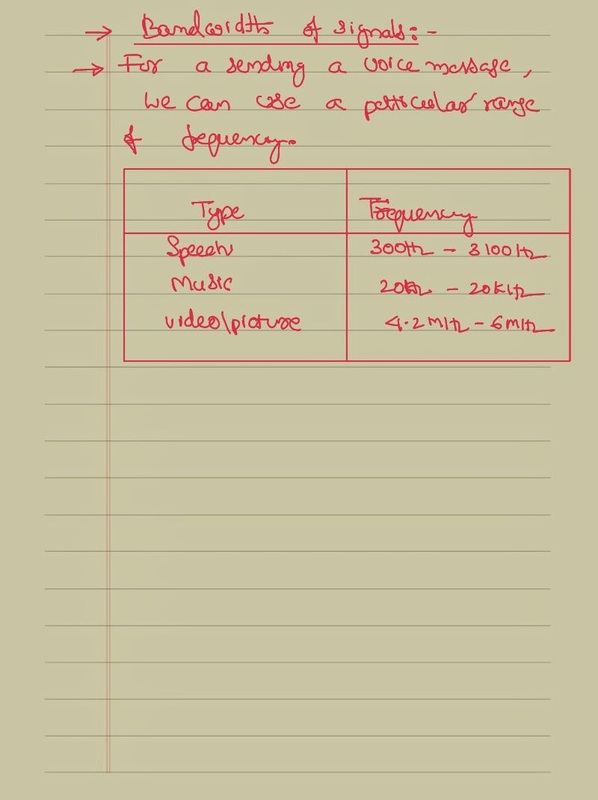 Because of this two basic reasons,now a days people are not using a ground wave communication system. There are different ways of propagation in this sky wave propagation. The first possibility is use a particular tower who can communicate and shall have certain height. This kind of the signals are released into the space.They will be further communicated to a specific region. 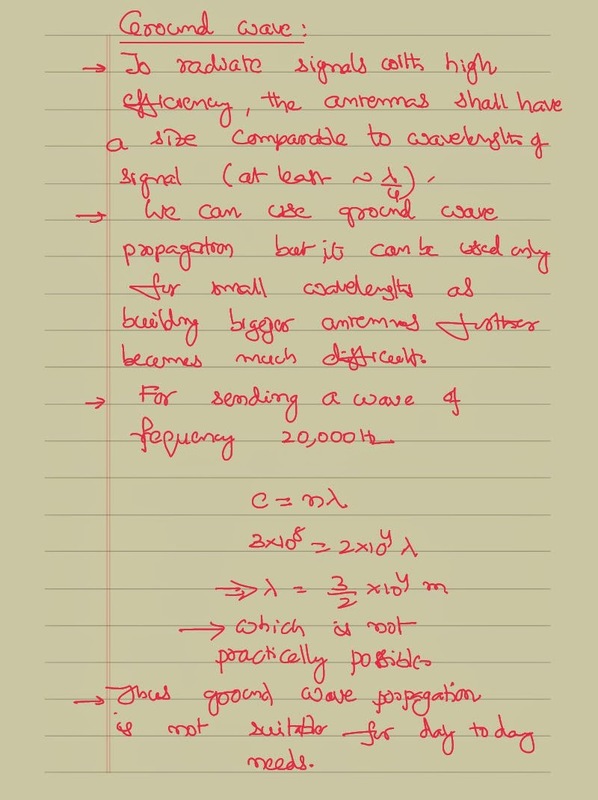 The distance up to with the signal can reach depend on the height of the tower as well as the radius of the earth is of course a constant value. Once if you know the distance up to where the signal can travel,taking that tip of the tower as a reference and the distance as a radius,we can draw a circle and that is the area up to where the signal can be reached. 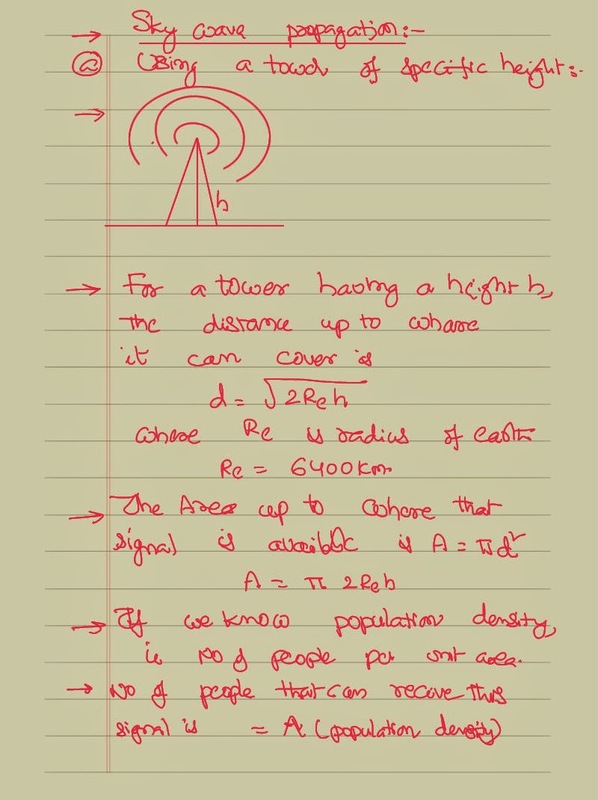 If you know the number of the people existing in the given place per area which is also called as population density we can calculate the total number of the people that can receive the signal with the help of this tower. This is simply done by multiplying the area with the population density.